All three seasons for Bethlehem have split into two unequal halves. The dividing point lies roughly between the middle and the end of May. The first three months focus on restoring and improving the game readiness of Union reserves and deep reserves. The next five months give enough minutes to academy candidates for pro contracts and other actual 18-year-old signings to make a fair, careful, accurate evaluations of their potential. Left center back A.J. Paterson, 22, has played just once, the full 90 minutes in St. Petersburg in the season’s second game. He has been on the substitutes bench recently and started for Grenada in its most recent Concacaf Nations League qualifier. Expect his Bethlehem option to be declined. Defensive central midfielder Antonio Lokwa, 18, practices competently. Teaching him the organization’s way of playing is a long-term project because he speaks only Lingala, the major language of the northwest region of the Congo river valley. Only fellow Steel midfielder Michee Ngalina also speaks it. Selmir Miscic, 15, signed with Bethlehem rather than overseas because he does not want to leave home and his friends yet. He practices with more confidence and impact among the Steel in October than in June. He is playing up two levels with the Academy U19s, and dressed for the playoff game against Louisville as did Brenden Aaronson last year, but the game did not move beyond recovery so he did not see the pitch. Omar Holness is 24. His season has been dominated by injuries. He signed while well-advanced in recovering from ACL surgery. At the very end of that rehab he needed a much less serious, but nonetheless surgical correction to something. At the end of that rehab, he suffered some type of lower leg injury. When healthy he is a clear choice as a substitute, having appeared as such nine times all at the end of the season. He has never established full 90-minute match fitness. In practice his leadership, intensity, and holding teammates to account is second only to the captain’s. We expect his option to be declined also. Mike Catalano, 23, is a central midfielder with collegiate experience at flank midfield who has also been training some at center and flank back. He has been hindered by injuries and occupies the most crowded set of slots on the 2018 team, the central midfielders. Expect his option to be declined. Aidan Apodaca, 22, is a striker who has lately begun to show signs of playing the position the way the Steel want. Expect his option to be declined. Prosper Chiluya, 20, is a left back with 14 starts, 16 appearances, 1,355 minutes and the winning goal at Indianapolis in May. Some games he has played without mistakes, others, not so much. He is on loan from Lusaka’s Kafue Celtic FC in Zambia. Left backs are scarce. Matt Mahoney, 23, is a natural right back who has divided his team-leading minutes between that position and all three others on the back line. Right center back has been the primary alternative. He will not return to the Steel; the first team might have interest because he is a more mentally reliable, smooth, versatile defender than Olivier Mbaizo. Left center back Brandon Aubrey, 23, is a good one even though he is right-footed. What sounds like an incipient sports hernia and the late emergence of Ben Ofeimu saw him on the bench, until the playoff-ender in Louisville. Expect his option to be declined. Drew Skundrich, 23, faced down competition from Holness and Catalano, but not Anthony Fontana at center midfield. When on his game, Skundrich covers ground amazingly and reads where he needs to be very, very well. Expect his option to be declined. Canadian Chris Nanco, 23, possesses that which cannot be coached, elite pace. He often subs on behind first-team starters, and he provides a noticeable offensive spark when he does. Opposing playoff coaches Bob Lilley and John Hackworth would both testify to that. Expect his option to be declined. Faris (Moumbagna), 18, is still learning to play the organization way consistently. He plays the most complex, difficult position on the pitch. He has learned not to be physically intimidated. Now he needs to learn not to get caught dishing out punishment. He also needs to learn to vary his initial offensive moves when gaining possession to develop the ability to surprise because sheer athleticism will no longer suffice for 90 minutes. He practices a lot with the first team. If he can do so without sacrificing pace and quickness, he needs 20 more pounds of muscle. Jake McGuire, 23, while contracted to the Union, was permanently loaned to the Steel and could not appear for them this season except in an official extreme hardship goalkeeper roster emergency. He and the Steel defense acquired some clean sheets during the homestretch, and his play during the playoffs was instrumental in the team’s success. But John McCarthy is better. McGuire is likely out of contract with the Union and will not be re-signed. Matt Real, 19, although having started in an emergency or three for the first-team, has 21 starts and 1,836 game minutes with Steel FC. He has a goal from his two shots on target out of 10 attempted. His early progress becoming a dominant offensive force was inconsistent against the best sides in the conference but has improved. So has consistent defensive effectiveness. He has been called up to the national U20s for the tournament that will qualify Concacaf’s four participants to next spring’s U20 world cup in Poland and is captain. He is one of USL’s “20 under 20” players. After recovering from a preseason knee injury, right back Olivier Mbaizo, 21, has, at times, been a dominant offensive force. Good teams and good coaches are now aware of him and deploy to mitigate his threat. Defense has been less smooth. Vastly improved communications skills and much greater comfort within the team are improving that. He started at right back in the first-team’s win over Kansas City in Chester. As a Bethlehem flank attacker Fabian Herbers, 25, has been competent. As a striker he had a brilliant stretch, showing real bite to his game. In consequence he regained substitutes’ minutes with the first team. The first team is not likely to bring him back because of Michee Ngalina. Captain James Chambers, 31, suffered a medial collateral ligament sprain to his knee in the 3rd game of the season and missed the next seven. He has started every game since and is second on the team with 2,575 minutes. His game in the playoffs against Pittsburgh is already legend. He is unquestionably the leader and is a teacher within the group. He remains too valuable as a player, on-field coach and leader in general to not return. Santi Moar, 25, consistently draws double and triple teams from most USL coaches and often defeats the extra attention. When he does not draw it, the Steel find him on long diagonal balls and he creates offensive chances for himself and his teammates. He is out of contract with the club, and it is unlikely that the first team will have interest because of Michee Ngalina. Michee Ngalina, 18, arrived in April and quickly earned practices with the first team. He demonstrates an elite change-of-pace when changing direction with the ball at his feet, and forced an experienced MLS right back, NY Red Bulls’ Conor Lade, to be subbed off at half time in a USL game because he was beating him like a drum. The first team should sign him after the expansion draft and the expected release of Marcus Epps and Fabian Herbers. 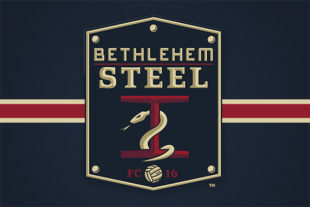 John McCarthy, 26, formerly the USL goalkeeper of the year with Rochester in 2015, is a dominant USL player when playing for the Steel. The first team will re-sign him unless FC Cincinnati or someone else takes him. Anthony Fontana, 19, has finally had a season free of major-injury, if not from minor ones. He began appearing for the 2018 Steel as a number 10 when the other side was anticipated to put heavy offensive pressure in the center of the pitch. Over time his ability to get himself on the ball in those circumstances improved. His late-season switch to his preferred number eight has seen a leap forward in his effectiveness. Adam Cann opines that he is only “scratching the surface” of what he can become. There have been flashes of never-before-seen spontaneous offensive creativity playing at the eight that were technically brilliant. Brenden Aaronson, 18, is the first Philadelphia Union Academy player to make the USL Team of the Week. Mentally he sees the game the way the organization wants a number 10 to see it, especially defensively. He is in his senior year at the Academy Schoolhouse. As expected he signed a homegrown pre-contract with the Union earlier this fall, in part to preempt overseas interest. Coach Burke says he is constantly asking questions seeking to improve his understanding of the game and his role. The impact of his Bethlehem Steel opportunities was recently made clear in U19 action against Red Bulls. Ben Ofiemu, 18, was the first Academy player ever to score for Bethlehem, doing so during the late comeback against North Carolina FC. Like Aaronson, Ofeimu is a rising senior. He plays center back. Some weeks after his debut when Burke was asked about him, Burke complimented him on knowing exactly what he wanted to accomplish and going after the goal with focus and purpose. The only time he has ever lost playing for Bethlehem was the playoff-ender at Louisville. In that game he was a significant reason why Louisville coach John Hackworth took USL golden boot winner, single-season goal-scoring record setter, and first-team all-league striker Cameron Lancaster off the pitch before time. He will sign as a homegrown player with either the Steel or possibly the Union. There have been no international call-ups for Andre Blake in conflict with Union games, so Tomas Romero, 17, has seen only one start and 90 USL professional minutes this year. His play in the little-publicized match against NYCFC’s reserves made spectating Ernst Tanner want to see him again. He too is a rising senior at the Academy schoolhouse. Tim, this is awesome. I love it, great job. It seems you are predicting a lot of turnover, probably a bit more than I expected. Not that I am surprised by it though. I’m wondering where you think they aim to fill the spots from, academy, draft, signings. 1B. Bethlehem took four Academy boys with them to both playoff games for exposure and to flesh out practices. One was Miscic. The othe three have never played or dressed for Bethlehem, yet, so coach asks that we allow them the privacy of not yet being legal adults. 2. Burke and Hogan have paid and will continue to pay close attention NCAA, not just. academy grads and Reading boys. If sources 1A and 1B above do not fill out Bethlehem’s squad, my guess is that NCAA may fill gaps. For parents reading this, remember that the Academy Schoolhouse overtly teaches the boys to be self-directed learners able to tach themselves their material using internet to do so remotely. And furthe remember that nooha Ahmed-Lee, schoolhouse Head, has been working actively to make herself expert in helping her alums and other Union players to pursue post secondary programs through SNHU. Both Aaronson and Miscic were clearly very aware Ahmed-Lee’s ability and willingness to help. Coach Burke has also addressed the point warmly. To quote Mark McKenzie substantively but not verbatim from a conversation this spring, soccer temporary. Miscic has said the game is not a basis on which to raise and support a family. The boys are realistically addressing the opportunity cost of risking going pro. And Mr Graham and his people are developing an lternative path forward to replace the NCAA athletic scholarship for an amateur athlete. Thanks again Tim. Loving it.